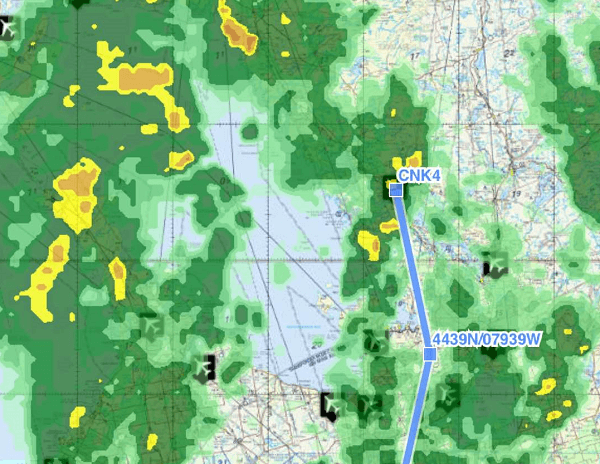 FltPlan, you may be aware, is an online flight planning system allowing for route planning, weather and more. The main reason we like this system is because – you guessed it – it’s free. Actually, it’s a bit more than that. There are several systems out there, capable of planning a flight and tracking it using GPS and moving-maps and you’ll know most of them. FltPlan however has good Canadian content – thus it was a great place to start testing. We downloaded the app Fltplan Go (Apple / Android) to our iPad. We also have it installed on Android (phone) but for the sake of clarity (and an increasing need for close things to get further away – or use glasses), we used the full-size iPad. 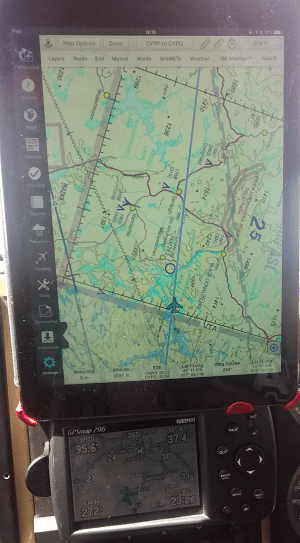 On-top of this, we purchased the Dual Universal XGPS150 with Bluetooth from Aircraft Spruce in Brantford (link). Why you ask ? – well, many don’t know that non-3G iPads (the wifi-only models) don’t have GPS built-in. Without a GPS connected, you won’t have your location – and that’s always nice! So, armed with the app and the GPS, the idea was simple. Fly from Sudbury (YSB) to Niagara (YSN) with two GPS system and compare. One was our trusty Garmin 296, used for eons and always simple and accurate. Doing a review of the 296 is redundent as it’s so well known and so out of date, it’s a bit too obvious – suffice to say, we love it! The accuracy was, as expected, pretty much the same on both devices. We had no issues with loosing our location and no issues with dropout or loss of connection from GPS to iPad. The app didn’t crash but we did restart it to see how that fared – again no issue. We found that locking the screen rotation was a good idea as we like to decide how to hold the map, not have it decide. This is done by the tiny switch on the iPad (Air) by the volume buttons. You can lock the screen in the app too – but we preferred the iPad way. Pinching to zoom and get information is fine – but we worry if there’s a distraction issue. It’s way too easy to get sucked into the system and away from the outside. I had to remember – “Fly the plane! Remember your training – pick a spot and aim for that”, using my navigation “aids” like maps and groovy computer stuff to back me up. It’s also worth noting that, even with a knee pad, it’s a lot of screen for a small space. With the CFS, notepad and pen for ATC frequencies and headings and the inevitable other cockpit clutter, it’s a bit much. The smaller form of the 296, nestled in the panel is almost easier. We’re VRF – all the time. This means (for non-pilots) we use outside visibility to fly and navigate and the map/GPS tech is there to assist us, not to guide or perform actions. For us, it’s a reference. We therefore use the GPS for a glance-on-track or “what’s around me” rather than coupling it to the autopilot, shooting approaches and all the other nifty stuff the (much) more complex systems do. Where the Fltplan excels the 296 is weather. Hook-up your iPad to your phone for data and you can get some pretty up-to-the-minute in-flight satellite weather to show you what’s happening. A good pre-flight briefing is also good for that (I can hear echos of my CFI) but it’s great to see some of the same stuff the 737-drivers see! We didn’t fly this (obviously) – but the weather in pre-flight and even in-flight is great to have – and free. All-in, we loved Fltplan Go. It has great Canadian content, useful weather and information (including most of the CFS, VTA’s etc.) and it’s free. It’s a perfect back-up GPS, excellent planning tool and all-around, a great product. It may be perfect for some people as primary nav/GPS – but we’re not quite there yet. We also played on it for 20+ hours before feeling totally happy with most functions. Finally, we feel this and other apps are somewhat complex for VFR. We wonder if pilots will rely too much on this new information and get into situations they may have avoided if they did not have such a tool. Also, there is the tendency to play on the iPad rather than fly the plane. Be careful with both of these things regardless of whatever system/app/tool you use. Remember, using a map and a finger is boring but that’s OK – there’s other stuff to do.